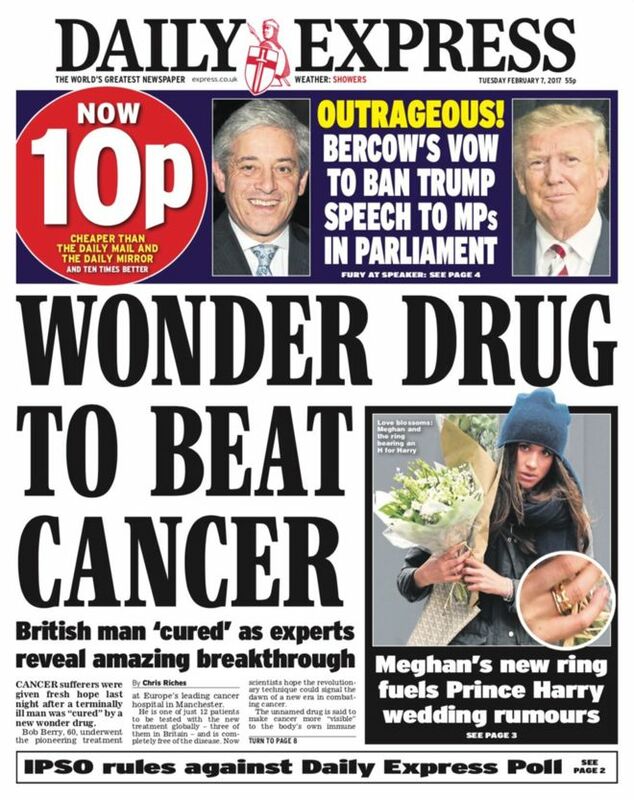 The Daily Express has flagged up a Brexit story correction on its front page for the second time within a week, following a ruling by the Independent Press Standards Organisation (IPSO). The newspaper was told by the press regulator that its splash published on 26 July last year, a month after the EU Referendum, with the headline: “98% say no to EU deal”, was inaccurate. The article reported that 98 per cent of people who took part in a survey said that the decision to leave the EU should be enacted immediately, rather than after talks with Brussels. The paper said the poll came after Prime Minister Theresa May told Tory MEPs that there could be “months of negotiations” before Article 50 is triggered, officially starting Britain’s exit from the EU. The story ran online the same day with the headline “98 per cent say NO to EU deal: Forget talks with Brussels and quit NOW, urges new poll”. This was also found to have breached Clause 1 (accuracy) of the Editor’s Code of Practice. The poll figure came from a paid-for telephone survey run by the Express inviting readers to give a yes or no answer to the question: “Should UK end all talk of deals and quit the EU now?” which it claimed had 5,756 respondents. 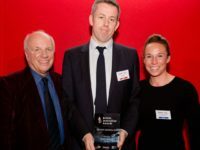 Tony McDonald complained to IPSO that the poll headline was “misleading” because it “did not make clear that the 98 per cent figure had come from a survey of Express readers, rather than representing the view of the public at large”, according to the press regulator. He said that because people had to pay to respond, it was unlikely that the average reader voiced their opinion and that only people with strong views would have responded, adding the poll could not claim to be representative of the newspaper’s readers as only about one per cent of its readership had participated. The newspaper denied the headline was misleading and said that because it ran a phone poll every day it was clear that the poll referred to was a survey of its readers. IPSO’s complaints committee said the headline, sub-headline and opening paragraphs of the article “gave the impression that it was reporting the significant results of a representative poll carried out by a third-party for the publication” in line with the “usual practices of political polls”. They added: “In fact, the poll was conducted through a premium rate phoneline, which allowed a self-selecting sample of the newspaper’s readers to express their views. The online article, which reported that a “new Daily Express online poll” had revealed the 98 per cent figure, also breached Clause 1 in the same manner. The committee added the newspaper’s “failure to correct this significantly misleading information” was a further breach of Clause 1. Because no attempt to publish a correction had been made, IPSO ruled the newspaper should publish its adjudication in full on page two with a reference to it on the front page. It said a link should also be published online with a link to the full adjudication appearing on the homepage for 24 hours before being archived “in the usual way”. Following the publication of an article in The Daily Express on 26 July 2016, headlined “98% say no to EU deal” in print, and “98 per cent say NO to EU deal: Forget talks with Brussels and quit NOW, urges new poll” online, Tony McDonald complained to the Independent Press Standards Organisation that the Daily Express breached Clause 1 (Accuracy) of the Editors’ Code of Practice. The complaint was upheld, and IPSO required the newspaper to publish this adjudication. The complainant said that said that the headline was misleading because it did not make clear that the 98% figure had come from a survey, rather than representing the view of the public at large. He said that a genuine poll could not have found 98% of the population who would agree with the question asked in the poll, and that a responsible poll would have ensured a representative sample. The newspaper denied that the article was misleading. It said that the headline needed to be read with the text of the article, from which readers would have understood that the 98% result came from a phone survey of its readers. The survey question was “Should UK end all talk of deals and quit the EU now?”, and was printed on page 7 of the previous day’s edition of the newspaper; readers had to pay to register their response to the question, and were asked to give a ‘yes’ or ‘no’ answer. IPSO’s Complaints Committee did not accept the newspaper’s argument that because it ran a phone poll every day it was clear that the “poll” referred to was a survey of its readers. The Committee also took into account the fact that the poll had been presented as a significant political event, putting pressure on the Government to leave the EU as soon as possible, and including responses to it from senior political figures. In all the circumstances, the Committee took the view that the article gave the impression that it was reporting the significant results of a representative poll carried out by a third-party for the publication. In fact, the poll was conducted through a premium rate phoneline, which allowed a self-selecting sample of the newspaper’s readers to express their views. In these circumstances, the manner in which the poll was presented, was a breach of Clause 1. 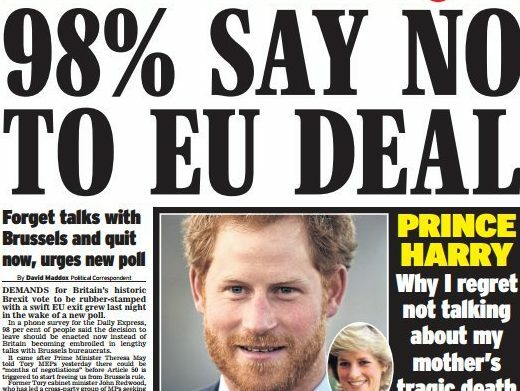 The online article, which reported that a “new Daily Express online poll” had revealed that 98% of people had said no to an EU deal, breached Clause 1 in the same manner as the print version.